The mere mention of Virgin Media's chief exec Tom Mockridge is enough to trigger the profanity filter in the UK cableco's customer forum, El Reg has discovered. 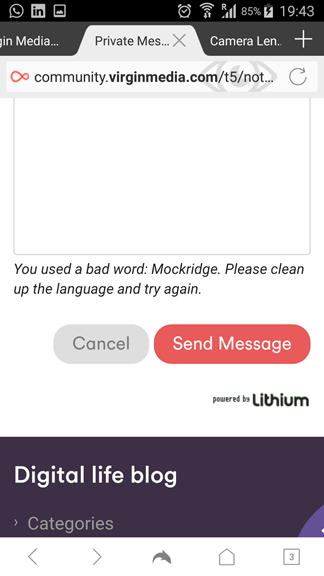 Typing in the name "Mockridge" prompts the response: "You used a bad word: Mockridge. Please clean up the language and try again." Even referring to the head honcho's email address in a private message on the community board prompts the same response, according to the screen grabs we've seen. Bizarrely, mention of Mockridge in the public forum itself seems to be OK.
Mockridge took the helm in June 2013, following the completion of the takeover by Liberty Global for $23.3bn (£17.8bn). But since then, some staff have been unhappy about the direction of the company. In a conference call last year, of which The Register saw a transcript, staff complained that Liberty Global were "faceless change drivers with no concern for the Virgin values".